Queens Removals proudly offers home and office removals in Weybridge at low cost without compromising on service. Whether you're moving from a studio flat or a mansion, our experts will assess your requirements. We'll provide you with a free, no-obligation quotation. Queens Removals employ specialist removals men to take care of your piano, fine art and antiques. 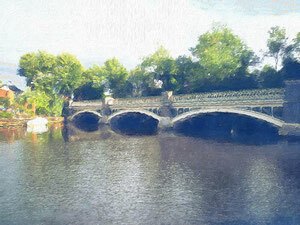 This Surrey commuter town sits close to the confluence of the River Thames and the River Wey, hence the name Weybridge. It's 20 miles south west of central London with three major motorways nearby, and a commuter train journey to Waterloo that takes around 30 minutes. There are two property markets in Weybridge: the mainstream market and the ultra-prime market. Weybridge has both private and state schools. There are two local private primary schools both in Walton-on-Thames, three private secondary schools and two popular state infants’ schools. The junior school is judged to be “outstanding” by Ofsted and the local comprehensive gets above average results at GCSE. There are also a number of international schools. Weybridge has a pretty town centre along the High Street with a branch of Waitrose and Morrisons plus branches of clothes brands. Baker Street, off the High Street, is where the independent shops thrive. There are more shops along Queens Road and Oatlands Drive. The fast trains to Waterloo take around half an hour; the slower trains stop at Clapham Junction for trains to Victoria and Vauxhall for the Victoria line. An annual season ticket costs £2,532. Weybridge is close to the M3, M25 and M4 motorways. Weybridge is a town in the Elmbridge district of Surrey. Served by two schools for seniors and two for juniors, Weybridge is a vibrant, clean and friendly little town with great transport links and plenty of parks for young and old to enjoy all year round. Rowing, rugby, cricket and football are some of the popular sports played by the locals. Queens Removals is based right in the heart of Weybridge Business Park and provide excellent services to the local community. These services include domestic and commercial removals, worldwide deliveries, storage and man and van services.